In the wartime send-up All Through the Night, Humphrey Bogart plays Gloves, a too-cool gangster with his hands in everyone's cheesecake. When his favorite baker goes missing, Gloves' mother (Jane Darwell, The Devil & Daniel Webster) gets worried and asks her baby boy to investigate. Before he knows it, Gloves is up to his neck in murders and Nazis. 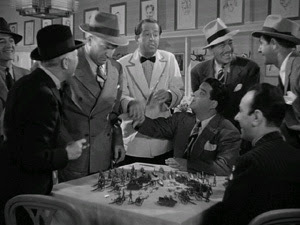 Directed by Vincent Sherman (The Damned Don't Cry), All Through the Night gets a little too rah-rah in its second half, when the normally selfish Gloves joins the war effort and gets all of his underworld pals to join in, but the movie stays fun thanks to a relentless comedic pace and a tremendous supporting cast. Gloves' crew is massive with comic legends like Phil Silver, Jackie Gleason, and William Demarest. The bad guys are also as bad as the crooks are funny. 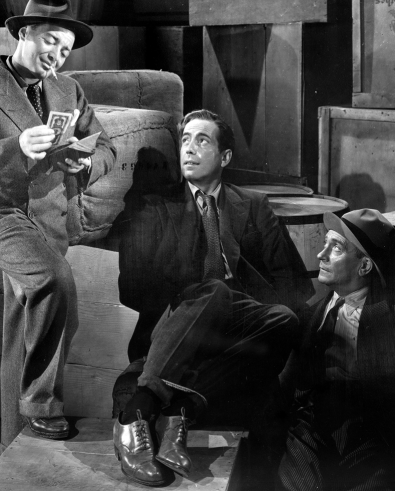 The two main Nazis are played by Bogart's future Casablanca co-stars Peter Lorre and Conrad Veidt. The climax, with Bogie stopping Veidt from blowing up a docked battleship in the New York harbor, is definitely over the top, but it's still a blast, both literally and figuratively.